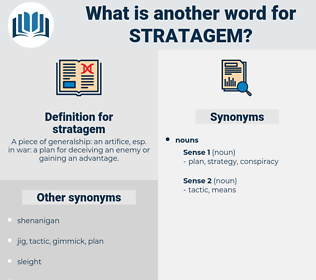 What is another word for stratagem? A piece of generalship: an artifice, esp. 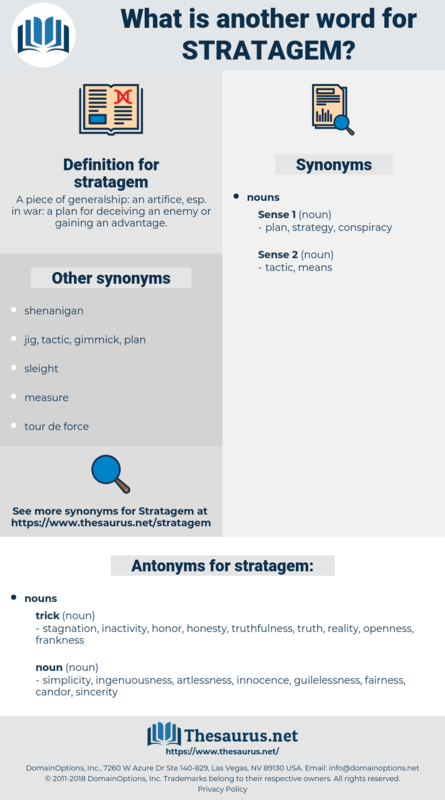 in war: a plan for deceiving an enemy or gaining an advantage. stagnation, inactivity, honor, honesty, truthfulness, truth, reality, openness, frankness. simplicity, ingenuousness, artlessness, innocence, guilelessness, fairness, candor, sincerity. The little obstacle was to be overcome by stratagem and by force.
" This is a fine stratagem," said Aerssens, " to fling the States - General headlong into the war, and, as it were, without knowing it." manoeuvre, Tactical Manoeuvre, maneuver, tactical maneuver.